On the evening of 11th November I joined Jon Bounds with a sizable gang to take part in the after -dark round of his ‘psychogeographical epic’ 11 Bus Project. The idea is that everyone has ‘a window of eleven hours to complete a circuit of Birmingham?s number eleven bus’, recording their observations and findings as they trundle along in whatever way they see fit. This resulted in the rather surreal and badly edited film above – most of it is speeded up to the iMovie max with the first and last few seconds at normal speed (I wanted to keep the explanation we gave to a stranger who asked us what we were doing, and everyone waving goodbye at the end). Of course I was completely wrong about the timings. As Jon said, “Birmingham’s a big place, you know,” and it took us almost two and a half hours to get around. So once my Flip ran out of juice I got out my camera and started taking pictures of people on the bus. 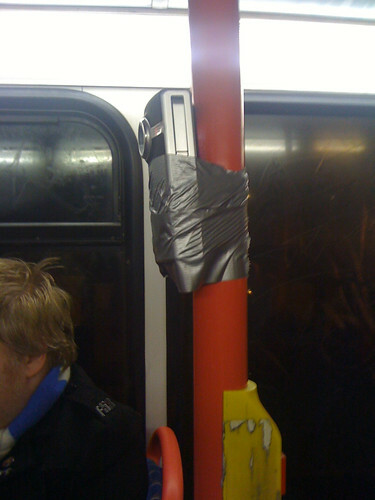 Those within our happy 11 Bus crew were aware of me doing this but strangers on the bus, whose backs I snapped, weren’t. What I found most interesting about the doing the circuit was how our large group changed the normal seating patterns on the bus. Younger, cooler kids kept walking onto the top deck and looking longingly at the back seats we occupied before settling for the seats at the front end. We seemed to upset the usual social order of 11 Bus riding and turfed the kids out of their comfort zone. Me and Ben Whitehouse chatted about this and more on this audioboo he took during our journey. All in all it was a really fun thing to do – I got to meet and share sweets with new people, see a bit more of Birmingham (including Perry Barr, where you can be a star) and enjoy some post bus-ride drinks at the Hare and Hounds with friends. I think next year I’ll definitely go in the daytime, so I can see and record more of what’s outside the top deck of the bus. NOTHING. Page 56 is blank. I swear I’m not making this up. I stuck strictly to the rules of the meme and this is what happens. It’s a well good book though. The pages with typing on are great. Proof that even when getting down to sirius conferuns bizniz, people still have that natural inclination to play and turn the whole thing into one big game. 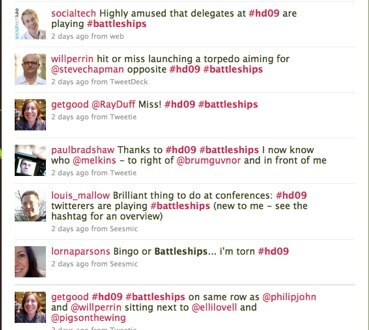 At the Hello Digital 2009 conference everyone settled down in the main hall for the opening speeches…and a game of battleships ensued on Twitter. It started with people stating their locations (‘one row behind and 6 seats to the right of @paulbradshaw’) and others present trying to trace them. 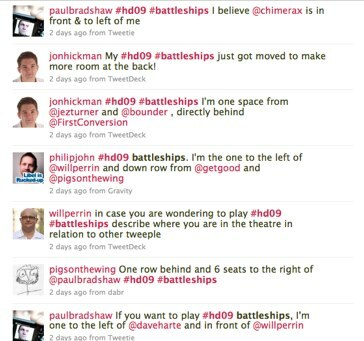 It then progressed to launches of torpedos and the like – the audience were trying to take each other down. So next time you’re at a conference and find yourself a little distracted, don’t drift off – connect to those around you via Twitter and have a little fun.